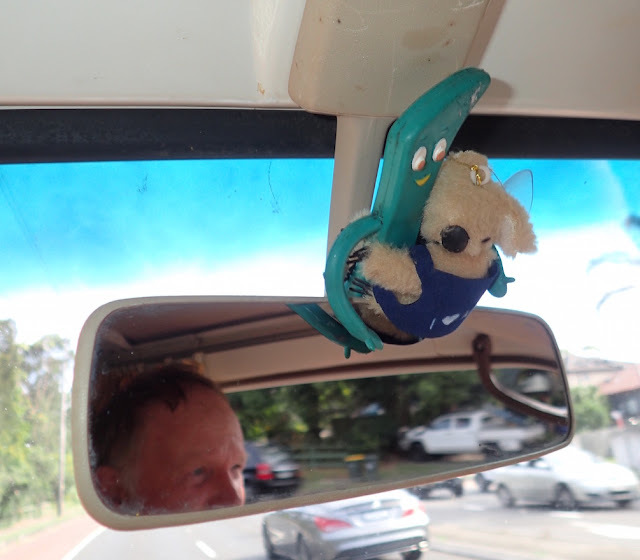 Our protectors -- Gumby and his new sidekick hang on for the very start of long Australian road trip. It began out of Pittwater, a Sydney Australian suburb, Feb. 2, 2017. Since 1984 Wayne's hung tight with his found sidekick, Gumby. Despite some radical downsizing into our new nomadic "home," (which included a temporary breakup of our cruising Holy Trinity), we're still sticking with Gumby as we hit the road. Thanks to Chris(tine) of Scintilla, Gumby won't be lonely. He's being joined, appropriately enough, by a koala (from Chris). Perfect for the Land Down Under, also known as Australia (or "Oz"for short). Do we need to add one more member to resurrect a trinity? Or is two company, and three a crowd? Journey, her pre-sale spa treatment complete, is still parked on a DBY Boat Sales mooring for sale in Pittwater, New South Wales, Australia (S33.39.433 E151.18.051). We are at the moment finishing our fourth day of misadventures on the road, and the moment in another Sydney suburb, Hornsby. Why Hornsby? More on that and our transition from open ocean to open road coming up (as well as some fill-in posts on cruising and blog post cleanup).